It is my honor to join you this day, the first day of the new year, one wherein most upon the Earth decide that this year their life will be different - they will become different. We are all aware of the result for the majority. Failure is experienced early, dedication and commitment falter - the change shall be delayed until next year when life is not so challenged. I should like to take some time this day to teach, to provide knowledge of that which I believe will aid each of you in better understanding the path. It is my desire to provide answer based upon the conversation that was had just a short time prior to this teaching. The Teacher must be ever cautious about providing answer to the student that may not yet be prepared to hear that which is referred to by those in these higher realms as knowledge. Those in the lower realms refer to it as truth, yet truth is personal to the self is it not? Each individual regards the self’s beliefs as truth. The goal for all students who walk the path to healing is to open the self to knowledge, recognizing that knowledge is merely that which has been earned by the self through many lifetimes. Those who hold tightly to their beliefs and determine that other knowledge – that which conflicts with the self’s - need be rejected, for great jeopardy is posed to the self who is not yet ready to relinquish the belief system. The consciousness is not the soul nor is the consciousness the Higher Self. The consciousness is the repository of all experience for all lifetimes, both physical and non-physical. This repository is often referred to upon this Earth plane as the Monad. The Monad is the Creator, which is often referred to when one is seeking solace. The Monad, of course, is connected to Source, that which is known as All-That-Is or God upon this Earth plane. 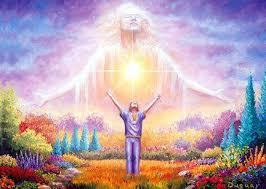 The soul or the Higher Self is indeed one entity that is not, nor will it ever be, physical in nature; it experiences through that which it creates, guiding, nurturing, counseling, loving, hating. All emotions are expressed through the Higher Self and are then filtered back to the Monad, the end result being that which is the purpose of the existence of all that has been created – to experience, to understand all things. This is a very simplistic explanation – one that each has learned in previous lifetimes. It is now time to understand who you are as an individual within this hierarchy of Monad to Higher Self to that which has been created to experience in the physical. The Monad has created the Higher Self, lending it that which is needed in order to experience in the realms that are available that are not physical in nature. The experience of the Higher Self begins in the lowest kingdom – that which is known as the mineral kingdom, and progresses very, very slowly through each realm – [the plant], the animal, followed by the human, followed by the etheric. Our explanation shall not reach above this, for it is the next level alone that each has the possibility of experiencing in this lifetime. Each individual present is a part of a being of higher consciousness different from every other person present. It is rare, however it is possible, that two can be in the physical realm and can connect with each other that belong to the same Creator. Again, this is extremely rare and is mentioned only to put to rest questions that may arise in future. It is indeed the Creator that has goals, purpose – that which has been striven for through time that is unimaginable to the human. It is important that each make the recognition that the Creator of the self is present with you at all times. It is difficult to fathom how this can be, for this Creator has created many individuals; suffice it to say that time is not an issue for the Creator. Turning the attention upon the student - the creation, informs the Creator of all that is needed. Guidance is provided to the Higher Self who then attempts to teach. It is the individual that decides whether or not this lifetime will be one of progress or failure. The connection grows ever stronger as the individual seeks that connection and proves through the actions of the self that this presence is desired, that the self is willing to experience all that the Creator needs to experience in order to accomplish the goals set countless years, millennia, previous. Each individual has experienced many, many, countless incarnations, countless existences and yet as stated earlier, all that remains for the self – the new self in each incarnation – is the aversion to certain activities or the drawing to others. Memories are withheld, for they can be destructive to the new individual. Information is provided in order to assist, never to engorge the sense of self that seeks such. Sol: Well, is it possible for me to have …my teacher…do I have a teacher that’s waiting in the wings? Indeed - all consciousnesses have a Teacher my brother; this Teacher is referred to as the inner Teacher, that which is comprised of the Higher Self and the spiritual guide. You receive nudgings, urgings, hints, whisperings as well as the drawing forth of lesson so that the self may continue to learn at the self’s own pace. Te' Auna is attempting to expedite the pace for each student, recognizing that you each must decide, determine for the self, if you are desirous of such. As stated earlier, there is no penalty for seeking a path that is slightly reduced in pace. I do not plan to offer you answer, for it is not my role as Teacher - it is to draw forth lesson. It is for the student to find answer within, for the answer does lie within with the Higher Self who has accumulated knowledge from all lifetimes, who awaits the calling of the self - seeking assistance, seeking information, seeking experience that opens the door to that which continues to be locked within.